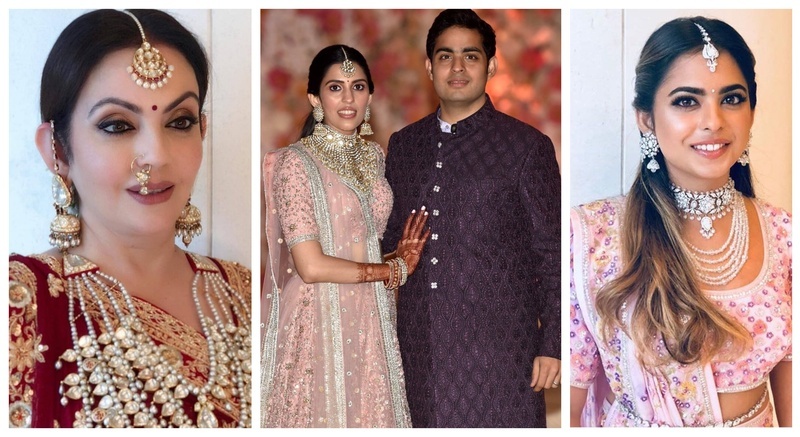 All the insider pics & deets from Akash Ambani and Shloka Mehta’s star-studded pre-engagement sangeet party! Celebrations have begun at the Ambani residence in full swing. After all, it’s Mukesh Ambani and Nita Ambani’s son, Akash Ambani’s ‘pre-engagement sangeet’ (wonder how many pre & post parties will they have for each function though :p) with his fiancée Shloka Mehta tonight! Believe me, Ambani’s left no expense spared. The guests started pouring in from early evening and it sure was a star-studded affair. The who’s who of the country marked their presence and obv took the internet by storm. Here’s the stunning bride-to be in all bridal finery posing with her sister Diya Mehta and to-be sister-in-law Isha Ambani. While Isha opted for a baby pink lehenga embroidered with intricate blooms, the bride chose an all-gold lehenga. Both Isha Ambani and Shloka Mehta’s pick for the evening was designer duo Abu Jani Sandeep Khosla, and both paired their ensembles with diamond chokers, matching maang tikkas and chandelier earrings. PeeCee sure looks the glowing bride-to-be herself in a all-red Abu Jani Sandeep Khosla creation. How cute of a couple do Sachin and Anjali Tendulkar make, complimenting each other’s outfits? Sister in law, Isha Ambani looking all pretty! Her makeup was done by Vardan Nayak. With the pre-wedding festivities like this, I cannot imagine what the wedding is gonna be like.